I don’t know how, but I missed the Tex Murphy games completely. I was a kid who loved adventure games and detective stories, yet I don’t remember even being aware of the series until I was older. At some point, I also learned that creator Chris Jones plays Tex in the games’ signature FMV sequences. I found that super endearing, but it didn’t send me running to the series any faster. After all, a non-actor playing the hero in a story he made up could easily be a four-disc exercise in self-indulgence. Even if you started with a decent crime plot, you’d have to layer in a healthy amount of solid humor, self-deprecation, and dopey enthusiasm to really make a thing like that work. So, it’s a good thing that Under a Killing Moon does just that. 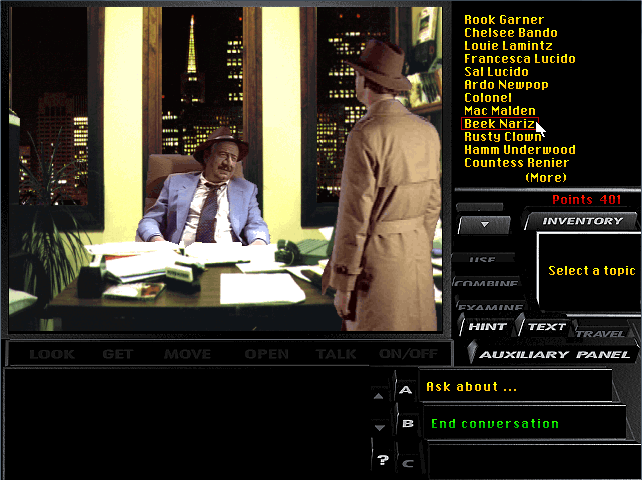 You play as Tex Murphy, a perpetually down on his luck P.I. Like the previous games, the setting is a future (post-nuclear) San Francisco, but the tone is firmly rooted in 1940s noir. A visit from your old mentor is followed by a string of pawn shop robberies, which eventually ties you up in a plot involving a stolen statue. 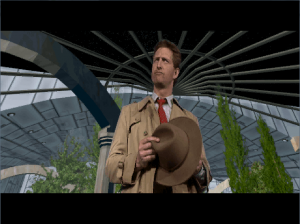 Plenty of gorgeous dames (well, budget FMV gorgeous dames), nasty crooks, and horribly disfigured mutant informants pop up along the way as you unravel the conspiracy and, predictably, attempt to save the entire world from destruction. The story is a respectable Raymond Chandler style detective tale, with enough big questions to keep you involved in the mystery. The answers to those questions are satisfying, but the journey’s more important than the destination. I wouldn’t say that plot takes a backseat to the jokes and banter, but it’s definitely riding shotgun, and that works just fine. A handful of characters from the past games make appearances, which is fun if you recognize them, but you won’t miss much if you gave those early outings a pass. My only gripe with the story is that it takes a long time to get going. The pawnshop case doesn’t have much to do with the bigger missing statue case that most of the game revolves around, leaving your first caper feeling more like an extended tutorial than part of the narrative. Still, both are fun, and at worst you’re getting two adventures for the price of one. Under a Killing Moon follows Mean Streets and Martian Memorandum, but it’s the first in the franchise to explode across your screen in glorious full motion video. The producers were duly proud of this fact, as evidenced by the manual. It grandly describes how they “threw away all previous conceptions of an interactive movie” and chose to deliver you 2.3 gigs of entertainment, rather than making cuts to fit on fewer discs. It was a good move. 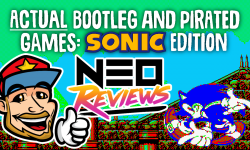 The previous Tex games are certainly fun, but I doubt the series would have gained a real following without this entry’s interesting blend of 2D sprites, 3D environments, and clips of real actors on bluescreens. How do I ask where he got that great suit? 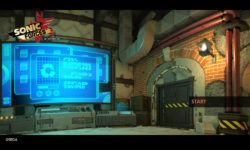 The game bounces between first person exploration in 3D rooms and video conversations with a large cast of characters. 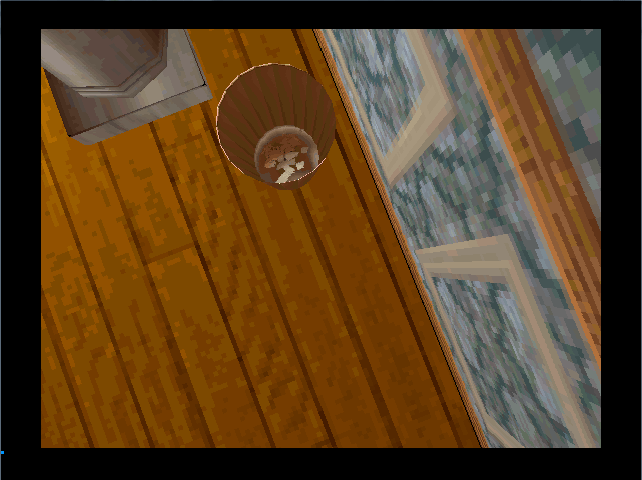 In the exploration phase, you’ll sniff around different locations, picking up anything that isn’t nailed down. Objects in your inventory can be used in the world, combined with each other, and examined; sometimes leading to further clues and puzzles. 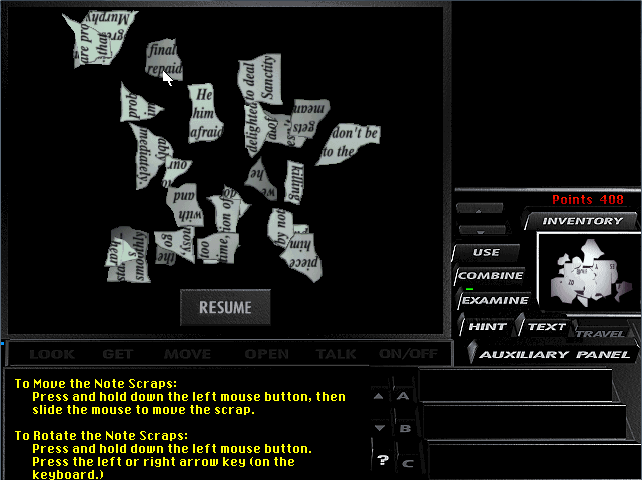 More than once, you’ll find a torn up note or memo that you can manipulate with the mouse to reconstruct the message. All of this gives you more information to populate your “ask about” list; a set directory of topics you can inquire about when talking to characters. But before you can run down your list, most folks want to do a little small talk. In these sections, you choose from three vague “attitudes” for Tex to adopt. I don’t mean a standard three choices that show up for everyone; each character has their own options, depending on the circumstance. One choice can lead to a new set of options, and so on until you either succeed or offend them enough to make them clam up. They’ll always forget about it when you try again, meaning you’ll eventually find the right path down the conversation tree. That’s when your subject becomes willing to talk about the important stuff, namely your actual list of clues. There were dialog puzzles like this in Martian Memorandum, but these feel much less random and they’re better written to boot. One thing not included in Under a Killing Moon is gunplay. Unlike the previous games, there’s no shooting, or even inclusion of your gun as an inventory item. It’s in your office, but picking it up just results in a cut scene that neatly dismisses your weapon for the rest of the game. I never missed it. Tex doesn’t need bullets to do damage. Unfortunately, for an exploration game, the movement controls aren’t its strong suit. 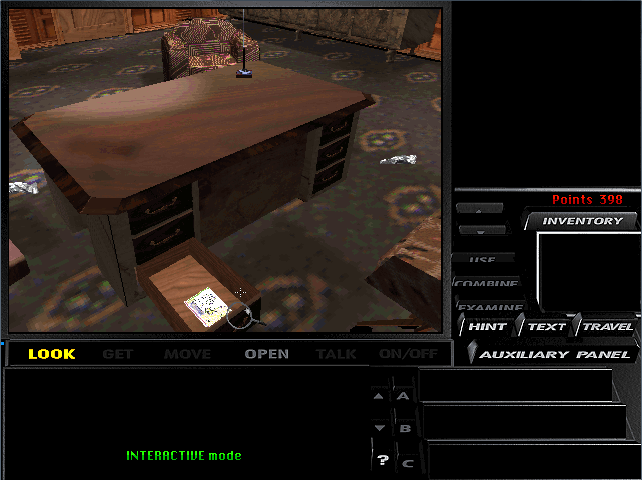 In what probably seemed like a really cool idea at the time, all your movement is on the mouse. Push forward a bit to start walking. More to go faster. Back to slow down, stop, or reverse. Sliding left or right rotates your view. When I first started out, I was almost never doing what I meant to be doing. Even with the speed turned to “Slow,” one wrong nudge sent Tex hurtling across the room, or spun him 180 degrees from what I wanted to look at. Eventually, I took the mouse sensitivity all the way down as well. This corrected the issue, albeit at the expense of a somewhat sluggish cursor. Nothing in this drawer but bad memories. Oh no wait, there’s a penny. With all the movement on the mouse, the designers had to put all the looking around on the keyboard. There are commands to change your viewing angle by 30 degrees in various directions, or tilt it down or up, but it all feels so clumsy. If I’ve got to have my other hand on the keyboard anyway, how about I just use the arrows to walk and the mouse to look? I realize mouselook was far from a standard at the time, but it’s annoying to stand over a desk you want to search and fiddle with the keyboard until the drawer you need to open is actually visible. Further, some clues require you to view things from a very specific angle, like the inside of a trash can or the top of a shelf. This means that after you’re done searching a room from your standard viewing angle, you’d better search it again from the “looking at the ceiling” and “looking at the floor” angles just to make sure. It’s doable, and you’ll get used to it, but it’s way more work than it should be. Movement aside, though, the rest of the controls work quite well. When you’re in “Interactive Mode” (toggled on with the spacebar), you use Look, Get, Open, Talk, and On/Off commands to investigate the world. 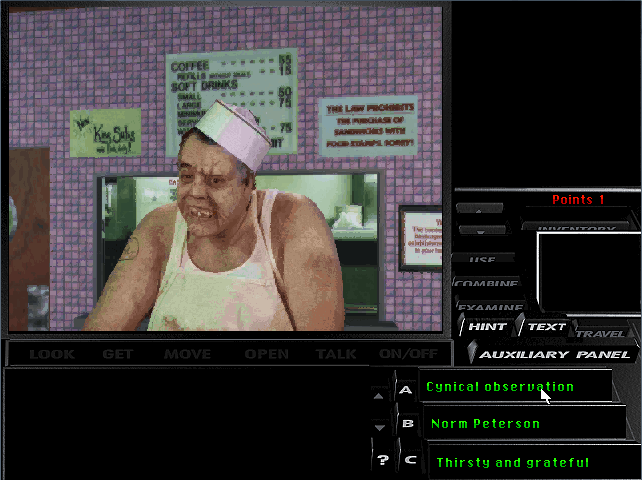 A fairly standard adventure game interface, but with a twist that’s somewhat ahead of its time: When you mouse over an object, only the verbs that actually do something are available. Purists may wish they could try to “Open” everything they come across, just in case it actually does something the thousandth time, but I was pretty happy to have that chore off my plate. The Look command is the real star of the show here. Clicking it gives you a wry description from Tex’s inner monologue. Chris Jones performs these lines quite well, and the writing is funny enough that I would routinely look at things even if I already knew what they were and how to use them. 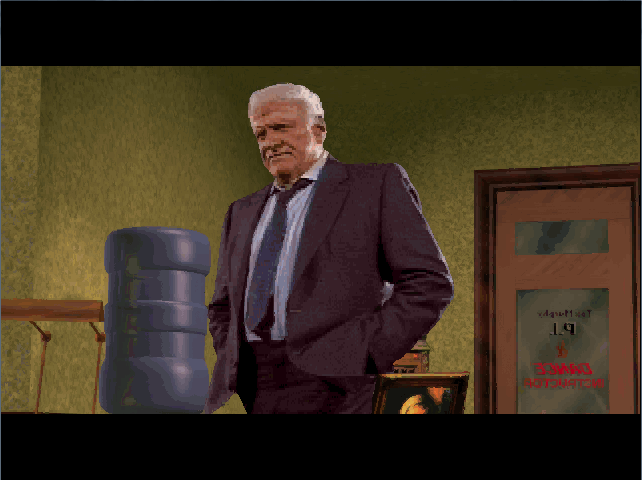 For me, that’s the mark of a good adventure game. Jones isn’t the exception. All of the acting is at least serviceable, and at best quite good for a PC game. That’s thanks to some excellent appearances by character actors like Brian Keith, Margot Kidder, and Mister James Earl Jones himself as the voice of the “Big P.I. in the Sky.” Sure, you’ll still run across the occasional gloriously bad joke or hammy line reading, but for me, that’s part of the charm. The actors are especially important, what with the emphasis on questioning the characters. These conversations feel more natural than in previous games, mostly because the topics each person knows about are a lot more logical. If you need leads on an antique, talk to your pal at the pawnshop. That’s a step up from Mean Streets, where characters had connections you’d never be able to guess, forcing you to ask everyone about everything or risk missing something critical. 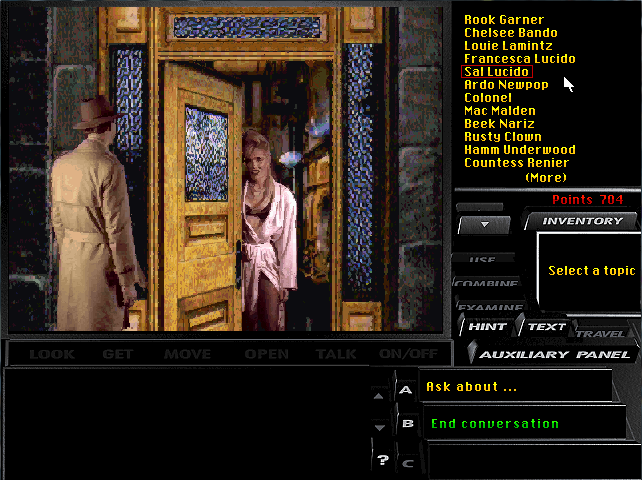 Under a Killing Moon gives you the clues you need to chat up the right person on the first try, and that makes you feel a lot more like a real gumshoe. I did get stuck a few times, though. The answer was almost always that there was an object in the room I didn’t notice. The game can definitely become a pixel hunt, with one puzzle asking you to notice the one loose rock in a long and unimportant looking rock wall. The good news is that there’s a pretty nice hint system. Each puzzle has an ordered list of hints, and each hint costs some amount of points, which you’ve been earning as you play. You never have to use it (and if you want a full 1000 point score, you shouldn’t), but if you need a nudge in the right direction, this does the job handily. Even without buying a hint, looking at the directory of puzzles sometimes got me back on track. Though I noticed later that just opening the hint menu sneakily deducts one point from your total. Under a Killing Moon has its flaws. Movement is, at least to me, unnecessarily difficult, and those who can’t find charm in mid 90s FMV (well executed though it may be) should probably look elsewhere. But Tex definitely scratches that old school adventure itch, and if you let him, he’ll grow on you like the fungus on a bachelor’s bathmat. Or something. 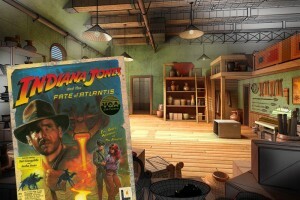 If “adventure game humor” is a distinct brand of humor, this game’s got plenty of it. Cracking the case is plenty fun. Movement takes some getting used to, and still never feels as intuitive as you’d want from an adventure game.